Among the events of the Jewish lifecycle, the wedding is one of the most significant. It is marriage which leads to many of the other covenantal and celebratory events of Jewish life. But there remains a high rate of intermarriage between Jews and partners of other faiths. According to the United Synagogue of Conservative Judaism, the current intermarriage rate is around 25 percent for children who have two Jewish parents. In households where only one parent is Jewish, that rate rises to almost 75 percent. And that’s where the Jewish lifecycle blows a tire. Despite the fact that many of our patriarchs and Torah heroes (like Moses and Solomon) married outside the Jewish faith, Jewish attitudes toward intermarriage range from simple concern to overt hostility. Both the Orthodox Union and Chabad spend much time and text on the reasons why Jews should marry only other Jews. Conservative Judaism has a special Web section for “Jewish Continuity/Prevention of Intermarriage,” with books and pamphlet titles like “A Return to the Mitzvah of Endogamy.” Although Reform and Reconstructionist Judaism do not condemn intermarriage, rabbis may or may not choose to perform interfaith weddings. Those who do officiate may impose conditions on the ceremony. Gruber, who grew up in an Orthodox home, says that he “lived the total Orthodox life.” He is an eighth-generation rabbi, and his father resettled the family from America to Israel when Gruber was 8. After attending Orthodox day schools in Israel, Gruber attended Yeshivat Sha’alvim and completed his military service in the Israeli army. He was ordained by the chief rabbis of Israel, and worked in New Zealand as the rabbi at an Orthodox congregation. Gruber spent three years in Kansas City running a Jewish educational organization, and two years in Toledo, Ohio at a Hebrew day school. He came to Dallas to be the assistant principal of Judaic Studies at Yavneh High School in August 2004. Gruber left Yavneh, as he could no longer be their Orthodox head. He and his family moved to Frisco, where he found a job in the financial industry. There, they assumed a Jewish secular humanist life. “To me, Judaism is primarily an issue of culture, history and an intellectual tradition,” Gruber says. Secular Jews, according to Gruber, have a long history of pride in their culture and civilization. Gruber estimates that between a quarter and a third of the Jews in Israel are secular Jews, and that many American Jews are as well. “Many of those people that they call unaffiliated, the Jews who do not belong to a house of worship — and even some who do belong — are secular Jews,” he says. But secular Jews still want to be part of Jewish lifecycle celebrations. Gruber quickly observed from different Web sites and “the blogosphere” that there were many Jews who wanted a Jewish wedding ceremony with a rabbi, even if they were not participating in any other aspect of Judaism. 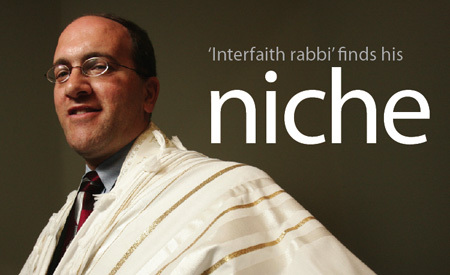 Though as an Orthodox rabbi he would never have officiated at an interfaith wedding, Gruber’s journey to secular Judaism changed his view on the subject. Gradually, Gruber made contacts with people like Rabbi Lev Baesh, the director of the Resource Center for Jewish Clergy at the organization interfaithfamily.com. Gruber credits Rabbi Baesh for pointing him to his current path. And so Rabbi Gruber, who formerly served Orthodox congregations, became Rabbi Gruber, the interfaith rabbi. SAN FRANCISCO (JTA) — Three new scholarly reports on intermarriage argue for increasing Jewish educational opportunities, encouraging Jewish behaviors among both intermarried and inmarried Jews and opening the doors even further to intermarried couples and their children. One report, the result of a new study, shows an intriguing correlation between rabbinic officiation at an intermarriage and how “Jewish” the family becomes. Saxe’s report, “It’s Not Just Who Stands Under the Chuppah” (www.brandeis.edu/ssri), is about to be released by the Steinhardt Social Research Institute and Cohen Center for Modern Jewish Studies at Brandeis. It analyzes intermarriage data from several sources, including the 2000–2001 National Jewish Population Study and a 2007 Reform movement leadership survey, concluding that intermarriage itself is not as critical in determining a family’s Jewish involvement as the Jewish partner’s background and education. In addition to that report, the Combined Jewish Philanthropies of Greater Boston just completed an in-depth investigation of its 2005 Greater Boston Community Study of Intermarried Families and Their Children. The investigation (www.cjp.org/communitystudy) follows up on the study’s much-debated finding, reported in November 2006, that 60 percent of children in the city’s intermarried homes were being raised as Jews. Also, the National Center for Jewish Policy Studies, an affiliate of Hebrew College in suburban Boston, will soon release a new study of 140 interfaith couples in Boston, Atlanta, St. Louis and San Francisco that describes an intermarried population whose eagerness to explore Jewish involvement is often stymied by communal barriers. With all of the reports and debates over intermarriage in the past two decades, some might think three more studies are overkill. Saxe disagrees. The “Chuppah” report, like the other two, goes beyond hand-wringing to suggest policies aimed at greater Jewish engagement for both the intermarried and the underinvolved. Relying both on national and internal Reform movement data, it shows that the Jewish behaviors and practices of intermarried families who are raising their children as Jews is almost identical to those of inmarried Reform Jews. Saxe and his co-researcher, Fern Chertok, caused a stir when they presented that finding at the Reform movement’s biennial in December. Their policy recommendations — that Reform Jews in particular must participate more actively in Jewish life if they wish to model Judaism for their children, and that this is more important to the Jewish future than staving off intermarriage — dovetailed with the initiative announced at the same convention by Rabbi Eric Yoffie, the president of the Union of Reform Judaism, urging greater Shabbat observance among Reform Jews. Creating a home filled with Jewish rituals and Jewish learning, Saxe and Chertok conclude in their report, has more influence on Jewish continuity than whether or not one marries a Jew. Thus the Jewish community would do well to encourage the former rather than worrying overly about the latter. The newly released Council of Jewish Philanthropies report came about in part as a response to widespread criticism of its central finding that twice as many children in Boston’s intermarried households are being raised Jewish as was reported by the latest National Jewish Population Study. “People asked, what did we mean by ‘raised Jewish?’” said Gil Preuss, vice president for strategy and planning at the CJP. “They said the way we asked the question led to a higher number of families saying they were raising their kids as Jews. The result of that investigation not only confirmed the earlier findings, including the 60 percent figure, Preuss said; it also showed that a couple’s initial decision to raise their children as Jews is the critical factor in determining an intermarried family’s level of Jewish involvement. Once a couple decides on a brit milah or baby naming for their newborn, he said, “the rest follows,” from synagogue membership to religious school to Shabbat observance. The CJP report also showed, as did the Steinhardt report, that at least in Boston, intermarried families in which the children are raised as Jews look pretty much like inmarried Reform Jewish families in terms of Jewish practice. Nearly 70 percent of the children in both groups become bar or bat mitzvah; similar percentages are enrolled in religious school and are members of congregations, although the intermarried families tend to join later and leave sooner; and both groups attend services with the same frequency. That didn’t happen on its own, local Jewish leaders say. One major difference was noted in the religious education of teenagers. Whereas 37 percent of inmarried Reform families and 61 percent of Conservative families enroll their children of high-school age in Jewish education, that number drops to 13 percent among intermarried families who are raising their children Jewishly. The CJP is using this to beef up its financial support for Jewish education, for teens and younger children, as part of its strategic plan to be unveiled in May. “The CJP will now spend a lot of time and money to strengthen the Jewish educational experience for 9- to 16-year-olds and their families,” Preuss said. Also, the National Center for Jewish Policy Studies has released the findings of a new and extensive intermarriage study headed by University of Connecticut sociology professor Arnold Dashefsky. Researchers interviewed 149 intermarried couples, mostly Jews married to Christians, in four cities, asking about their Jewish behaviors, degree of involvement with their Jewish communities, and negative and positive experiences with those communities. Titled “Intermarriage and Jewish Journeys in the United States,” it was not a random study — the respondents already were involved in Jewish or interfaith organizations from which researchers obtained their call lists. So with the Jewish partners having more Jewish background than the national samples used in other studies, the quantitative findings may not be widely applicable. Still, researchers say it could prove useful to Jewish institutions and communal leaders seeking ways to engage the most Jewishly interested intermarried families in their midst, a good target audience in any case. The researchers plan to follow these families for years to see how their Jewish behaviors evolve. Couples said their interest in Jewish participation was stymied in some cases by a less-than-welcoming community and the fact that a rabbi would not perform their wedding ceremony. Perhaps the most interesting findings had to do with rabbinic officiation at interfaith wedding rites. At a time when the Reform movement in particular is deeply divided between those rabbis and cantors who perform intermarriages and those who do not, the study found a statistically significant correlation between intermarriages performed by Jewish clergy and the later involvement of the couples in Jewish life. It marked the first such study to do so explicitly, say researchers who worked on this and the other two studies. The study found that 87 percent of those intermarried couples who were married by Jewish clergy later raised their children as “Jewish only,” compared to 63 percent of the couples married by co-officiants, by non-Jewish clergy or in secular ceremonies. Also, 50 percent said it was very important that their grandchildren be Jewish, compared to 18 percent of the second group. Even more striking is the correlation between rabbinic officiation and later avoidance of Christian behaviors. Just 2 percent of those married only by a rabbi now belong to a church, compared to 26 percent of those married in other ways; just 2 percent of the first group attend church on Easter Sunday, compared to 21 percent of the second group; and 46 percent of the first group put up a Christmas tree, vs. 65 percent of the latter group. The researchers were quick to explain that the study is not suggesting that rabbinic officiation itself has any influence on a couple’s future behavior. “The findings do not indicate causality,” Dashefsky cautioned. That is not how the couples themselves saw it, however. Among those couples in which a rabbi refused to perform their intermarriage, one-third — 30 percent of the Jews and 36 percent of the non-Jewish spouses — claimed that the refusal distanced them from any form of institutionalized Judaism. Conversely, nearly half (46 percent) of Jewish spouses who were married by a rabbi claimed that rabbinic participation in their wedding ceremony “had some influence” on their lives. These results only obtained in cases when a rabbi was the sole officiant, not when a rabbi co-officiated with non-Jewish clergy. Researchers say an interfaith couple that opts to have only Jewish clergy officiate at their wedding ceremony indicates a level of interest in and commitment to Judaism that does not pertain when a rabbi and a minister officiate together. “It’s a symbol of the direction this couple wants to go,” Dashefsky said. As in the other two intermarriage studies, the Hebrew College study found that even the most Jewishly engaged intermarried families are more prone to do things that inmarried Jewish families “don’t feel comfortable with,” Dashefsky said, like put up a Christmas tree. That should not be seen as making them less Jewish. “It doesn’t stop them from fasting on Yom Kippur, lighting Chanukah candles or joining synagogues,” he said. The challenge is for Jewish institutions and leaders to approach such families in a more nuanced, less all-or-nothing fashion, he said, allowing them to move at their own pace toward, or away from, greater Jewish engagement.